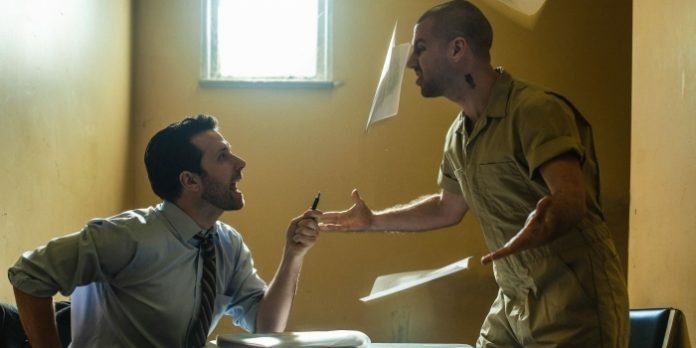 John Voth as Jewish defence lawyer Danny and Kenton Klassen as the neo-Nazi Mike in Cherry Docs. Following their critically acclaimed and Jessie Award-nominated The Lonesome West last year, Vancouver independent theatre company Cave Canem Productions is tackling another heavy-hitting production with David Gow’s Cherry Docs. Cherry Docs is the story of Danny, an ambitious Jewish defense lawyer, who after being assigned the case of an unrepentant neo-Nazi accused of murder, finds himself defending the life of a man who wishes him dead. Vancouver Presents contributing editor was live at Vancouver’s Pacific Theatre to find out more from Kenton Klassen and John Voth, the two actors who play this unlikely pair. Cherry Docs plays Pacific Theatre (1440 W 12th Ave, Vancouver) April 5-28. Visit pacifictheatre.org for tickets and information. We were LIVE at Pacific Theatre in Vancouver with actors Kenton Klassen and John Voth who star in the Cave Canem Productions presentation of Cherry Docs.Cherry Docs is the story of Danny, an ambitious Jewish defense lawyer, who after being assigned the case of an unrepentant neo-Nazi accused of murder, finds himself defending the life of a man who wishes him dead.Cherry Docs plays Vancouver's Pacific Theatre April 5-28. Visit http://pacifictheatre.org/season/2018-2019-season/mainstage/cherry-docs for tickets and information.